Several years ago, I considered ordering a favorite print of mine transferred to canvas. Let’s face it – that would be the only way I could have a Monet hanging in my living room. As can happen, life got in the way, and my idea faded from memory. A couple of years later, I started food blogging. Originally, it was an excuse for me to make a bunch of baked goods around the holidays, so I could pack them into baskets to give as gifts, without my family questioning why I was baking enough to feed a small army. As I continued to blog, I slowly learned more about the photography aspect and upgraded my equipment when I was able to. I cursed the lack of natural light in my little condo and resorted to using a flash when necessary. In fact, I only had windows on the north side of my place. There are no windows in the kitchen. I also had little space, no kitchen/dining table, and as such, very few options to set up a place to take pictures. But I made do, taking most pictures on weekends, crossing my fingers the skies would be sunny, giving me a chance to get some decent light. Over the past few years, I’ve gotten several pictures I’m extremely happy with. When I was contacted by Easy Canvas Prints to review their imgage transfer to canvas, I jumped at the chance. 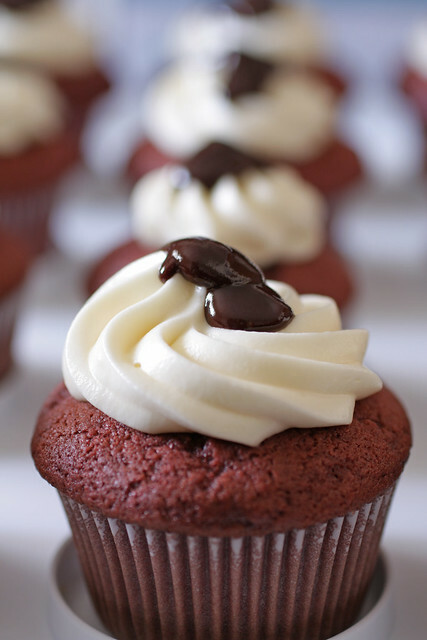 I put some of my favorite images to a vote among family and friends, and in the end, chose a picture of red velvet cupcakes. I cropped the image a bit to better fit the canvas size they provided me with (an 8×10 for my review), and chose the wrap-around-feature, meaning the image is stretched over the wood frame. I currently have the picture hanging up unframed, so when viewed from an angle, you can see more actual image. I’ve posted side-by-side images above of the original picture, and the canvas. I laid the canvas on a black surface, and took that picture with my little camera, which gives pretty good images, but nothing quite like my DSLR, which I used to take the original picture. I’m happy with the amount of detail on the canvas: the ridges on the top of the cupcake, a little air bubble on the frosting that I’d never paid attention to before, the hints of shadow, the accuracy of the color. I suppose the best way to provide a review of how satisfied I am is to let you know the following: I’m already planning which pictures to purchase myself. 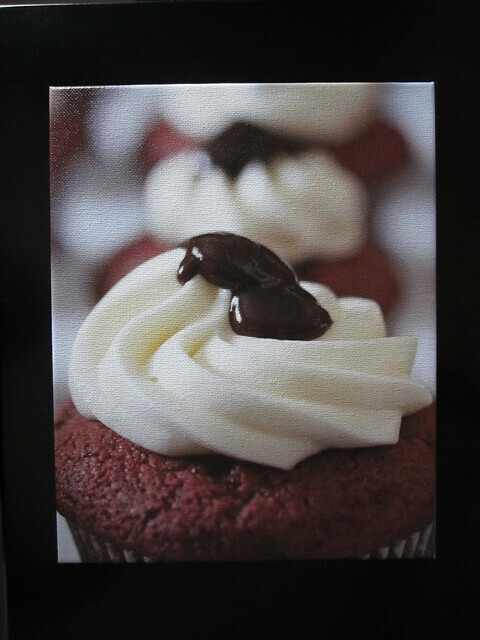 If you’re looking for a special way to display pictures of your own, I would definitely consider the canvas transfer. Disclaimer: I was given this canvas at no charge for reviewing the product. Thanks for the review. I’ve always wanted to try this. Seems like a special photo on canvas would make a terrific gift!